Yoga Shelter is located in Studio City and is a Michigan transplant. 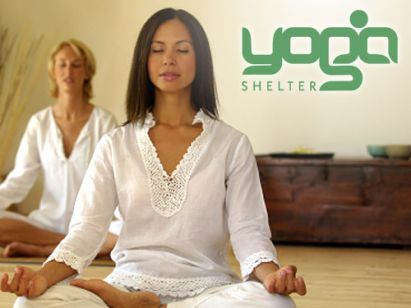 Yoga Shelter occupies the former Angel City Yoga location on Ventura Blvd and is directly across the street from Kings Road Cafe. The studio is extremely warm and friendly and the classes are amazing. There is plenty of street parking, just be sure to have a credit card or plenty of quarters (an hour will cost $1.50). Classes are offered seven days a week and start as early as 7:00am and run as late as 8:45pm. They have a variety of classes, from Slow Flow, Fusion, Yoga Rocks, and XFlowsion. We highly recommend that you stop by for a class or two…plus they are offering a free week for new students! I live down the street from Yoga Shelter and finally decided to stop in for the XFlowsion class! I must admit, yoga is not my workout of choice, but I am trying to expand my horizons in 2011. I took the 9:45 XFlowsion class and Rob Woollard was subbing for Lisa Paskel, and he was absolutely amazing! XFlowsion integrates yoga, martial arts and dance and is a trademark of uKarma Corp. To be honest, I was really nervous about the yoga class and almost didn’t go. Everyone at the studio was so friendly and didn’t judge me for being a newbie amongst all the yogis! Rob’s play list was so much fun, he had music ranging from Snoop Dogg’s Gin and Juice to 1980’s hair band love ballads. Rob has a great sense of humor and will keep you motivated and laughing during even the most challenging poses. I started to panic when Rob told us to grab a spot on the wall, I began to have flashbacks of a yoga class gone sour when I was forced to do a headstand and made to feel embarrassed when I was too scared to try. Rob surprised me by having us get into plank with our feet on the wall, it was so hard and so much fun. XFlowsion was an amazing class and I can’t wait to come back for more yoga! Rob is a fantastic teacher! He is a brilliant expert in yoga, health, and nutrition. Los Angeles is lucky to have such a fine instructor, while Michigan will surely miss his expertise! You’re so lucky to have Yoga Shelter! I was a devotee in Birmingham, MI and miss them dearly! Hoping their success in Studio City will bring them closer to Santa Monica this year! Thanks for the great review on the area, Kacie!